In the field of international business education, we know that we want students to combine analytic reasoning with the ability to function effectively in complex scenarios in which context-rooted problems require creative thinkers and problem-solvers. Often times, however, business instructors have overemphasized formal lecture and case method at the expense of active learning and experimentation. In addition, the methods of lecture and case study sometimes reduce problem solving to analysis, thus making students become detached actors looking to “get it right” or arrive at the “best” answer. At the same time, if students don’t have the opportunity to get out of the classroom and gather feedback during a course – by addressing innovation and ill-structured real-world situations – this can create an imbalance that graduates might carry into their careers. In an effort to change the above classroom situations into preferable ones, I started to utilize and apply design thinking for my Introduction to International Business course. In particular, I’m reframing my classroom into a collaborative learning environment, emphasizing to students that it is not my classroom but our classroom. Using the five phases of the design process, I have defined and refined my problem statement in teaching international business (step 1), which I think is probably one of the most challenging steps. In the collaborative context of “our classroom,” I want students to learn to be persistent in their pursuit of problem-solving while being and becoming more reflective. In addition, as a designer of “our classroom,” I too need to be persistent and reflective in my “art” (based on imaginative insights) and “craft” (based from practical experience) of implementing design thinking in order to: effectively build empathy with students (step 2), brainstorm with students and faculty (step 3), create collaborative learning activities (step 4), and test whether the activities meet the identified needs (step 5). Through design thinking, I have been able to observe and prototype (steps 1 & 4) in ways that have enabled me to structure learning activities that better support the course learning objectives. One example is the use of two or more learning style approaches so that the matching learning activities could result in higher levels of students’ academic performance and more lasting student learning in the course. On the first day of class, I collect my students’ learning preferences through a VARK questionnaire. After some discussion with students about how to understand their results in terms of the VARK modalities, I then design “response essays” in which students are expected to take a position relating to particular debates in international business. Students have the option of drawing their response with pictures and diagrams (the visual of VARK), doing an audio/video of their response (the aural of VARK), writing their response as an essay (the read/write of VARK), or sensing commenters’ experiences and reflecting on their own life examples on the debate (the kinesthetic of VARK). Depending on how many response essays I assign during the course, students are required to do response essays in at least two different VARK modalities. (Click to watch) A student’s “response essay” via the aural option on whether Apple can make iPhones in the US that are good for the company and good for US workers. From observation and feedback, I do get the sense that many students are generally appreciative of having more choice to demonstrate course competencies, and some students are willing to be challenged to use learning approaches with which they have less comfort. In terms of testing and refining, I have not yet done substantive assessment in regards to whether providing some choice in the use of learning preferences has a positive impact on students becoming more effective problem-solvers and creative thinkers. Another course learning objective that, to some degree, I have been able to prototype and test is that of designing a team-based project. Here, students are collaborating with me to provide zero interest loans to appropriate borrowers in California and in developing countries. Students are asked to develop microfinance proposals that could generate revenues through eco-friendly consumer products, from which the profits could then provide zero-interest loans to targeted communities. Under the testing and refining stage that brings in new ideas and improvements, I was able to anticipate that, after teaching a course or so there would be a number of team-based microfinance proposals that could be ready to be prototyped and tested by subsequent student groups. In fact, I have been able to offer subsequent student groups the opportunity to choose from and implement a number of prior microfinance proposals for which I provide seed capital as well as instructional feedback. Currently, my students act as both “makers” and “doers” in team-based projects through which profits for zero-interest loans have been growing and more potential borrowers in California and in developing countries have been identified. With each new class, another new team has the opportunity to not only uncover conflicting goals and constraints, but also to implement better ideas and solutions. Moreover, the collaboration between students and myself has gone beyond the classroom. A few students from these team-based projects formed a registered student microfinance organization on campus to further scale student-run microfinance projects. In fact, these students are now serving as “peer educators” in my course, which could contribute to better ideas and improvements to collaborative learning and project-based learning. Overall, design thinking has provided me with a process to transform my international business classroom into an effective collaborative learning environment. At the same time, design thinking has also allowed me to anticipate that dynamic collaboration may expose additional challenges and solutions. For me, design thinking indeed serves as a complement to the analytic tools and methods taught in business education by offering a framework for students to become creative thinkers and problem-solvers within a course and beyond the course. 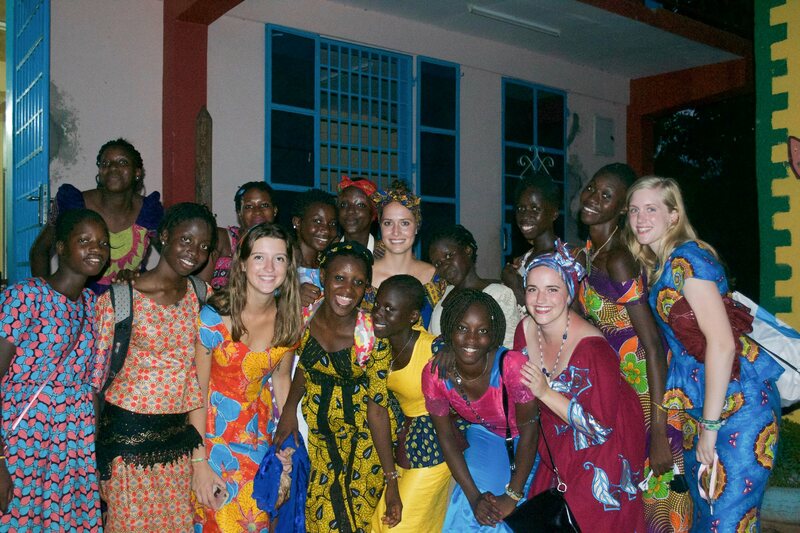 (Left) A student group interviewing young women entrepreneurs in The Gambia. After conducting due diligence, the group had decided to provide zero interest loans of $240 to two women. Through a local partnership with Starfish International and the school’s Global Fellows program, the two women entrepreneurs have received the loans and business training, as they are implementing their small businesses. The revenues for the above loans came from developing and selling eco-friendly consumer products, which were created and sold by previous student groups (Right).